Is the PACT a more comfortable alternative to mammography? Researchers have been developing a new method for detecting breast cancer called photoacoustic computed tomography (PACT), a fast, safe, and more comfortable alternative to mammography, a method for detecting breast tumors earlier and more often. Many women avoid getting screened with the current breast cancer screening method, mammography. Mammography can be uncomfortable or painful. Mammograms also don’t always reveal early tumors in denser breast tissue. The photoacoustic computed tomography (PACT) technique uses harmless pulses of laser light to penetrate the breast tissue. This causes a type of sound wave called photoacoustic waves to spread through the tissue. These waves can be measured by sensors surrounding the breast. 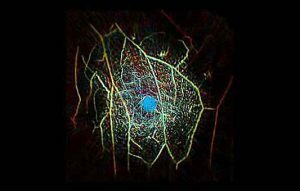 Blood vessels react to the light differently, providing contrast that allows PACT to form clear images of the breast’s blood vessel network. This approach can be used to spot tumors because tumor growth depends on blood vessels. Previous forms of PACT have been limited by long scan times and other factors that lower image quality. Recently, a research team led by Dr. Lihong V. Wang at the California Institute of Technology developed a system called single-breath-hold PACT (SBH-PACT) that overcomes these limitations. The work was supported by NIH’s National Institute of Biomedical Imaging and Bioengineering (NIBIB) and other NIH components. Results were published in Nature Communications on June 15, 2018. To test the technique, the researchers enrolled one healthy volunteer and seven female patients with breast cancer in a clinical study. The participants had a range of skin pigmentations and breast sizes. For the scan, a soft agar pillow was used to compress the women’s breast to her chest while she laid down. A laser was shone through the breast from beneath the bed. Sensors surrounding the breast detected the resulting photoacoustic waves, and this data was used to map the blood vessels within. This system generated 2-D or 3-D images of the entire breast while the women held their breath for 15 seconds. In the healthy volunteer, SBH-PACT produced a clear 3-D image of the blood vessel network throughout the entire breast. In the patients with breast cancer, SBH-PACT revealed eight of the nine tumors using the higher blood vessel densities of the tumors. The team was able to detect the ninth tumor using SBH-PACT to measure “elastographic” changes in breast tissue. Breast tumors are less elastic than normal breast tissue, so regions that changed less during breathing indicated tumors. This measurement could be taken in 2-D mode in about ten seconds. Both blood vessel density and tissue compliance were measured with the SBH-PACT system in about 30 seconds. Together, these two measurements can provide a quick and safe method to detect breast cancer. However, trials with more women are needed to confirm these findings. “Because of the detailed images created by PACT, we are looking at other uses such as assessment of the blood vessel damage in diabetics,” Wang says.